In 1936 a new school building was constructed between the ‘old’ Church and Convent, the foundation Stone being blessed and laid by the Right Rev JW Dwyer Bishop of Wagga Wagga. The ‘old’ convent was moved from the vicinity to the back corner of the playground behind St Mary’s where it was used as classrooms. Five Sisters were now teaching these classes. Then new convent school at St Josephs’ comprised six classrooms. It was the Administration Centre and also housed the Library and Resource Room. ​By 1926, four Sisters were teaching an ever-increasing number of classes up to Preparatory Intermediate. Alicia Ross was the first student to gain her Certificate in that year. On May 23, 1926, the Right Rev JW Dwyer, Bishop of Wagga Wagga, blessed and laid the Foundation Stone of the Convent of St Joseph, to be called, St Mary’s College (pictured above). Collections towards the cost of the building had £2000 in hand. 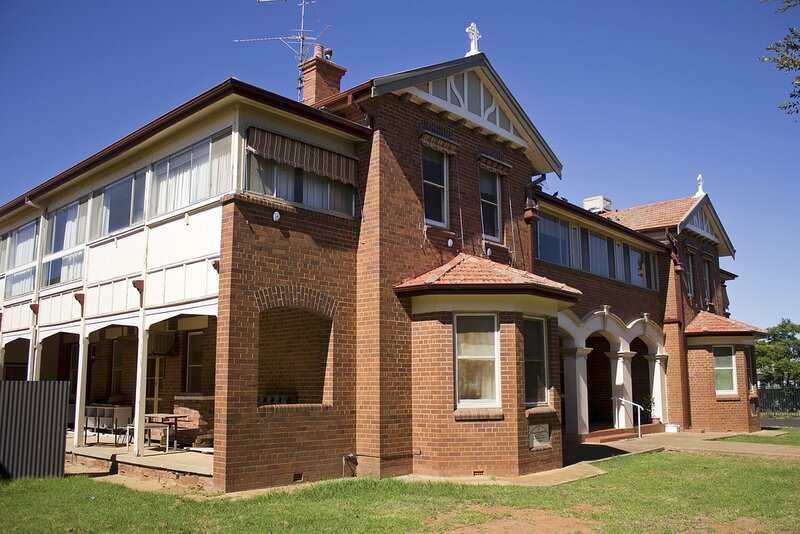 ​On May 4, 1927 the Convent Building was Blessed and opened by His Grace Archbishop Mannix of Melbourne and assisted by His Lordship, Bishop Slyer of Wagga Wagga. 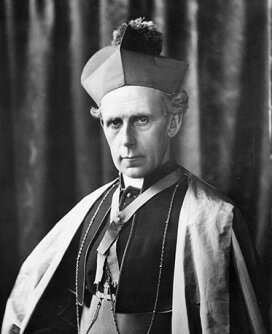 Also present were Monsignor Carey of Melbourne, Father Hartigan (author John O’Brien) of Narrandera, Father O’Dea of Griffith, and Father McManus. Local dignitaries were WC&IC Commissioner Evatt, Major JS Dooley and Parishioners. The front of the Convent was decorated with white, green and gold streamers and a large Union Jack overhanging the balcony. Blue House, O’Mara, is named after Sr Magdalene O’Mara (pictured below) who was St Joseph’s Primary School’s first principal. She led our school in tents and makeshift classrooms until 1936, when the first building was opened. 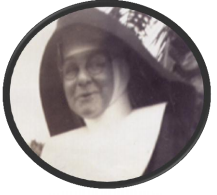 Sister Magdalene was a Josephite sister, who died in 1951. The first Sisters of St Joseph’s to arrive in Leeton, Sr Magdalene O’Mara, Sr Francesca and Sr Stanislaus, had nowhere to live. The parish priest, Fr Reidy, gave up his presbytery (on the corner of Ash and Coolibah Street) for the nuns to live in. For a time, Fr Reidy then slept in the sacristy of the church. ​Plans for the large two-storey convent were drawn up by Leeton architect George WA Welch and erected by contractor GT Taylor of Narrandera at a cost of 9,357 whilst the furnishings cost 730/10/0 – An impressive building in a town barely 15 years old. 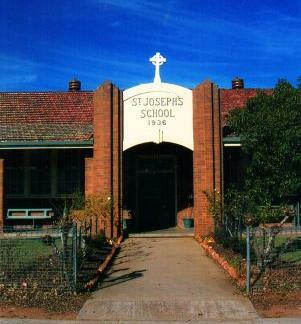 St Mary’s was a boarding school for about 30 girls attending St Joseph’s School until 1976. Earliest students included children from the Flemming, O’Grady, Keating, Glass, O’Callaghan, Eurell, Leighton, Irvine, Moore, Flannagan, Hourigan and Ross families, who paid 6d (5c) per child each week. Within a few years, the student numbers had outgrown the church space. In 1921 a weatherboard building was erected behind the church for infant classes (This building was later removed and rebuilt in Murrami as a church, but returned again to the school grounds to be used as a library under Sr Marietta).